"'Give us the food we need for each day.'" One of the great blessings of Israel's wilderness wanderings was the lesson of daily dependence. They had to trust God for their daily food. They couldn't gather too much and store it or it would spoil, ruin, and become a putrid mass of worms. They never suffered from having too little. They were reminded daily that the LORD is gracious, faithful, and practical. The prayer of our hearts is we, too, may experience the LORD as gracious, faithful, and practical. We want to know beyond theory and faith that the LORD provides and blesses. So we pray in humble recognition that today's food is not the work of our hands, but the blessing of God. We won't store up for ourselves and our glory, but depend upon his graciousness and use our overabundance to share his blessings. 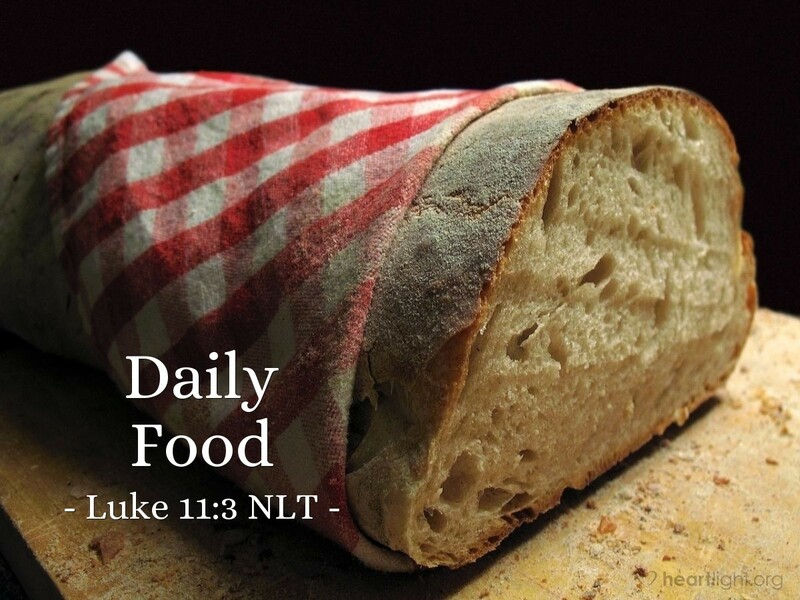 The food we have today is a reminder of the eternal faithfulness of our Father. Almighty God, Abba Father, thank you for the food you have given me today. Please supply it day by day and never let me think that it is mine because of my power. In Jesus' name. Amen.